While stainless steel is still the most popular material requested by our clients for both aesthetics and functionality, we also fabricate custom items from mild steel, aluminium, colorbond, zinc and galv. Summer 2018/19 – Bars and restaurants embrace our reluctance to stay indoors in Western Australia, by ramping up the BBQ’s and giving their Alfresco bars and mobile commercial kitchens a work out. Summer can also be a time to identify things that need modifying, or adding to existing Front of House (FOH) or commercial kitchens (BOH) to improve flow and efficiency. Sometimes, a complete re-think is required. Catering staff often have suggestions or “wish lists” for their work areas. Maybe we can help with custom stainless steel benches or bar tops, or a new speed rack, or bar foot rail. Maybe a dropdown in stainless steel counter tops for display cabinets, allowing customers to see the products better, while making it easier to pass purchases over the top. First stop would be – Rottnest Island, to check out the stunning black wine cage at Thompsons Restaurant (waiting on photographers permission to publish the photos). 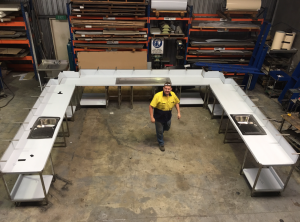 Then a long road trip to Esperance, with lunch at Loose Goose Restaurant and visit our huge U shaped stainless steel bench with integrated sinks. Next, head west to Albany, where the Laundrobar is doing great work for holiday makers and hospitality venues on our oversized stainless bench. Heading way up north now, to see lots of powdercoated mild steel furniture and shelving frames at Christ The King School in Lombadina, in the stunning Kimberley, fabricate by Coolsteel in pieces for transportation, and assembled on site by SK Cabinets. Lastly, and although no-one wants to end up in hospital, so lets just visit. Sir Charles Gardiner Hospital Endoscopy staff, work better with their new, functional and hygienic stainless steel pass through benches and shelving and cabinets in their Cleaning & utility rooms, custom made for their specific needs. And here endeth the tour. We covered many kms, and we only scratched the surface..luckily the surfaces are mostly stainless steel, and can be buffed out, or left for the “industrial look” which seems to be pretty popular in renovated older houses in the freo area, matched with stone benchtops…..sorry bad “Sheetmetal trades” Joke…. I’ll stick to tour guiding. Oh I almost forgot.. something to visit in January 2018 – Fenians Festival in Fremantle, will be cooking delicious BBQ on a huge scale, on our just completed, custom built Primal cooking system (watch this space for photos). Another 6 months of varied work, with custom stainless steel benches for all manner of industries, including a prison, trade training centres, shopping centres, community centre canteens and schools and Uni’s. Stainless steel is a fabulous long lasting and hardwearing material, and our ability to fabricate custom frames and benches, pass-throughs, and clad existing laminate tops in stainless steel, make it ideal for areas where “off the shelf” products are unsuitable. We also fabricated furniture frames for budding designers in mild steel and other products, and our trusty powdercoaters were kept busy with various table frames for workshops and schools. Bars and restaurants needing speed racks, glass racks, foot rails, shelving, coolrooms, table frames, Wine racks, wine cages, both functional and architectural, have a look at Bennys Bar in fremantle and El Grotto in Scarborough for our awesome work. This entry was posted in Uncategorized on December 1, 2016 by admin_webfirmdemo. So summer here in Perth ended quickly! Hopefully the shiny new stainless steel alfresco areas at various residential projects that Coolsteel completed were well used. And hope the stainless steel benches, powder coated frames, custom wine cages and speed racks (amongst other things) , at the hospitality projects that we fabricated and installed, all get rave reviews. Check out El Grotto in Scarborough , Benny’s Bar in Fremantle, Badlands bar in Perth. I think a few visits may have to be made over the next few months… you know… purely for quality control purposes of course. And now we are almost in winter, outdoor BBQs are swapped for dinners with friends at the latest restaurant. Interior designers and bar / restaurant owners are constantly coming up with new style ideas to attract consumers, that can’t be met with imported or off the shelf products. This is where CoolSteel comes in with our custom stainless steel benches and bespoke bars tops with integrated sinks, foot rails and skirting. Hard wearing and functional, and made perfectly for whatever space you have. Small bars are fabulous, but a headache for architects trying to fit everything in. Give us a call, see what we can do. We work with various metals (Mild steel, galv, aluminium, stainless steel, colourbond) that can be used to achieve styles from Industrial to Hollywood bling. In hospitality, Stainless steel is the preferred material for functionality. Flow of employee traffic in bespoke bars / cafes / restaurants often means that efficiency ideas evolve and existing fixtures and fittings need to be modified. This is also something CoolSteel Fabrication may be able to help with.